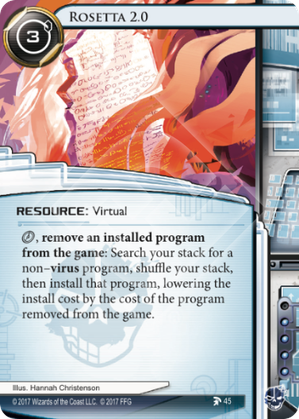 click, remove an installed program from the game: Search your stack for a non-virus program, shuffle your stack, then install that program, lowering the install cost by the cost of the program removed from the game. If the Runner removes a program hosted on Dhegdheer from the game as the cost for using Rosetta 2.0, by how much is the install cost of the new program lowered? Dhegdheer’s cost reduction only applies at the time the program hosted on it is installed. The install cost of the new program will be lowered by the printed cost of the trashed program. Since Earth's Scion was released i was looking this card thinking "it's something but i can't grab it". Then i realized, OH MY GOD ! London Library !!! And that's work too if you have something in your grip and another copy in your stack !!! Ok, now we have the engine, but what for ? Although the math for this doesn't compare well to Special Order, I actually really like that they gave Criminals another option that feels like you are rolling with the punches. The biggest complaint we have gotten so far from the majority of Criminal programs that aren't icebreakers are that they are niche. And some of them are super niche. Cards like Copycat, Tracker and Sneakdoor Beta are great examples. Copycat can be great depending on the situation! It might even be better than an inside job because of the way corp servers can be stacked up. Most competitive decks run 3x of all sorts of ice. Now, for the brief few months til rotation that card is actually decent rather than complete garbage! Sneakdoor is probably, currently the widest application of "freaking awesome" to use it with. Simple click a program into a sneakdoor and boom, you are off to the races. When it becomes impractical to run Archives to get their sweet, sweet HQ simply bid Sneakdoor adiue and grab some other awesome program. Really, what this allows is Criminals for the first time to be a bit like shaper and splash ultra impactful, non-virus programs into their decks. I think the best targets are going to be cards that force responses, but that could change based on builds. But the first time they find and slam down their keyhole, I am probably going to cry "Oh man this card is OP!"